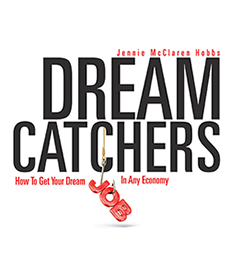 Dream Catchers: How To Get Your Dream Job In Any Economy is available as an electronic download from Amazon, Barnes & Noble, and iTunes (US) for $6.99. Links for purchase are below. Each will open in a new tab. Downloads for the Amazon Kindle version are available on all Kindle devices, including Paperwhite, Paperwhite 3G, DX, and Fire HD. Purchases are completed using your Amazon account. Downloads for the Nook version are available on all Nook devices, including Simple Touch, Glowlight, HD, and HD+. Purchases are completed using your Barnes & Noble account. Downloads for the iBooks version are available using iBooks (1.3.1 or later) on iPad, iPhone (3G or later), and iPod Touch (2G or later). Purchases are completed using iTunes and your Apple ID.